I'm a huge goal person...weekly, monthly, yearly. I'm constantly journaling and making lists of goals. But there are some things that don't fit into a list. They can't be squeezed down to a year or a month or a week...they aren't things that can eventually be accomplished and crossed off the list, not to be thought of again. 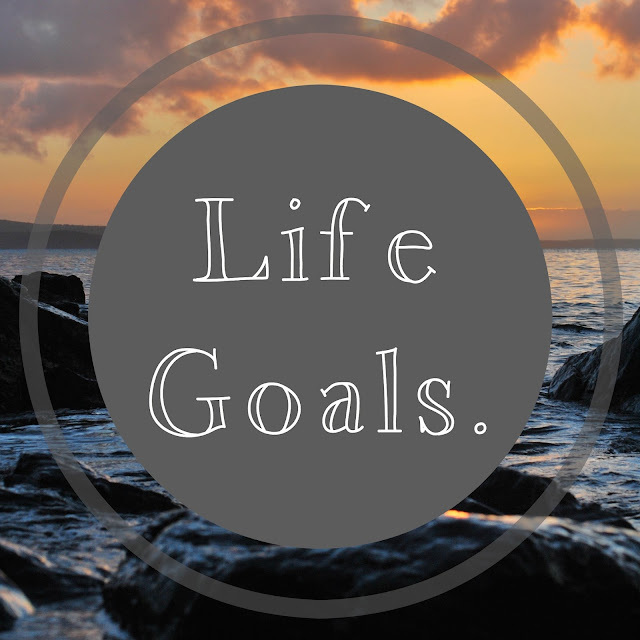 Things that are more like life goals. Be a good listener. In my opinion, being a good listener is one of the best qualities a person can have. It's such a treasure to have a friend who will really listen to you, not sit on their phone and nod or obviously be thinking of something else. That's the kind of friend I want to be. Be a hard worker. I never, ever, ever want lazy to be a word that describes me. Sure, I enjoy lounging around and watching Netflix or spending the day reading just as much as the next person, but when it comes to the work I'm supposed to do, I want to be a diligent and hard worker. Be someone who brings other people happiness. There are people in life that make you happy just by being with them, and there are people in life that make you tired just by being around them. I want to be someone who is encouraging, not negative. Who leaves people happier than they were. Be someone who doesn't always need something/need to be doing something to enjoy life. I love going to the pool. It's one of my favorite ways to spend a day. Recently, I've decided that people can be divided into two groups. There are people who can hang out at the pool with friends, and as long as there's food and drinks, be perfectly content spending a whole day just talking and swimming and hanging out. And then there are people who can hang out at the pool with friends for about a hour before needing to make plans for what's going to happen next, where they're going to go tonight, what they're going to do today. Personally, I think the first group is way more fun to hang out with, and that's the kind of person I want to be. I don't want my happiness or level of enjoying life to depend on what things I have or what plans I have. I've got plenty more, but those are some of my life goals I've been thinking about lately. I very much dislike being around people that always have that "Where are we going next? Who should we invite over now?" mentality all the time. I am very much a go getter but it's nice to just relax and enjoy who is around. Love the pool analogy! Being someone that makes others feel happy is important to me too...and I am always working on being a better listener! oh i love these! listening is somethign I really need to work on! Love these life goals! I think I want to be the person that shows up - the one that friends know they can count on no matter what! I'm totally a hang by the pool all day kinda gal! I think it's important for me to be well-liked and dependable. Someone you can really count on! I think being a good listener is so important. I like the idea of just staying at the beach or pool all day but I usually get too hot or bored. I never used to feel that way as a kid so maybe I need to find that again. Those are awesome goals. I hadn't really ever thought much about this. I mostly just make monthly goals. But I'm going to think about this now. Thank you for the inspiration. It's about finding the smaller things in life that bring you joy, not rushing on to the next event/person/whatever. Life passes us by far too quickly; stop and savor every moment for we are all blessed in many ways. Love love this! I need to work on the lazy thing... totally agree with the pool! I've always been most content when I'm just hanging out with lovely people. Such great goals! I mostly just want to love on others. Like I want people to know me as a passionate person who just loved life. Great things to work towards! I am constantly working in the last one with you - enjoying the moment. I often find myself on my phone or worrying about something random when I should just be enjoying the moment. Sometimes I'll just leave my phone on silent and out of sight to try and avoid it. love this. I've been working on being a good listener as well - I recognized its a quality I always appreciate in a friend... but not necessarily one I've been cultivating. I'm definitely the first group of pool people, bring it on! LOVE these goals! And I totally hear ya on the different types of people. I'm one of those who's perfectly content hanging by the pool all day (and night!) with good friends, food, and drinks. Why would I want to leave and go do something else? my life goal: hang out with you more. miss you tons need to see you soon. Great list! I guess one of my major ones is to have more experiences and less things. I don't want my life to be measured by what I have, but by what I do and who I am.